NASA is back on track. On Friday, December 5th, 2014, their Orion spacecraft launched from Cape Canaveral in Florida. Boosted into high orbit by three Delta IV rockets, Orion traveled to an altitude of 5800 km (3,600 miles). That’s 15 times higher than the ISS, and over 9 times higher than any Space Shuttle ever climbed. The video above has a sound track, so turn on your speakers. After a hiatus of 3 years since the Space Shuttle retired, and after hitching rides on Russian Soyuz rockets (at $70 million per ticket), the USA is moving to regain its preeminence as a spacefaring nation. The Orion launch was unmanned, but several critical systems were tested and passed with flying colors. The 4-hour test flight orbited Earth twice, and splashed down in the Pacific off the Baja coast, 970 km (600 miles) southwest of San Diego. NASA used the combination of three Delta IV rockets, made by Lockheed Martin, in a configuration known as a “heavy lift system.” It can carry a payload of up to 15,000 kg (16.5 tons) to high Earth orbit (HEO) and beyond, burning liquid oxygen and hydrogen. Future missions will use NASA’s new Space Launch System (SLS), now in development. SLS lift capacity will start around 70,000 kg, and evolve to 130,000 kg. By comparison, the most powerful Russian Soyuz configuration (Soyuz-2-1b/Fregat) has a maximum payload of 9000 kg to low Earth orbit (LEO). 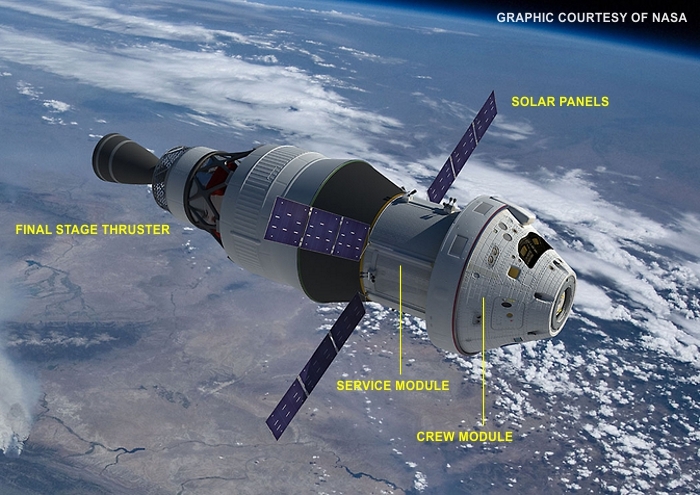 One critical mission test was the efficacy of Orion’s shielding against radiation. Orion passed twice through the Van Allen radiation belts surrounding Earth. The only humans to venture that far from Earth were Apollo astronauts back in the late 60s and early 70s. Their exposure was brief, due to the high velocity needed to reach the Moon. They absorbed only 20% of the allowed maximum radiation dose. More worrisome to Orion engineers is the effect of that radiation on sensors and electronic components in this highly advanced and computerized spacecraft. The first manned mission could come as early as 2020, and will set the stage for missions to the Moon, Mars, and beyond. After some fine-tuning, Orion’s next flight, again unmanned, and tentatively scheduled for early 2017, will take it around the far side of the Moon. The thumbnail below shows a typical configuration with the final stage thruster still attached. The capsule-shaped crew module (which is used for reentry) looks much like the old Apollo program capsules, but has a spacious 8.95 cubic meters (316 cubic feet) of living space. The Apollo capsules were much smaller, with only 5.9 cubic meters, accommodating a maximum crew of 3. 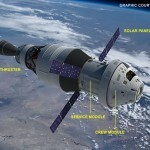 Orion can house a crew of 6. Orion has been in development since 2003, the year of the Columbia Space Shuttle tragedy. NASA knew the Space Shuttle needed a capable successor — the Shuttle couldn’t reach orbits much higher than the ISS, and was scheduled for decommissioning long before it was officially retired. Still, it served for some 30 years as the workhorse of the US space program. Space Shuttle Atlantis flew the final mission in July of 2011. NASA is ready to enter the next stage of space exploration. They’ve been doing LEOs for half a century. Orion, carried by the SLS, is capable of HEO and beyond. The Moon, Mars, and the asteroids are now within our reach. It’s another giant leap for mankind.